Pre-qualification happens today, and our official meet-and-greet with the real estate agent comes right after. I just hope that everything goes smoothly, and the timing all works out for us. I'm nervous as hell, but when I see my poor hubby working at home in our living room / dining room / kitchen space every day, I know that it's the right thing to do. So here's a toast to finding a wonderful new home, and then not moving again for a LONG, LONG time! My baby sister is going to be a mommy at the beginning of May. As soon as I found out she was pregnant, we started planning for me to come in for the baby shower, and I started working on her secret gift! It was so much fun to see everyone this past weekend to celebrate the new addition to their family. Thanks to everyone for coming out. I hope the party was fun, and I hope everyone had plenty of good food to eat!! My wonderful friend from Texas has been such an inspirational parent over the last couple of years, and I decided to steal one of her MANY great ideas for my sister's baby gift. Whenever we would go visit them from our home in Dallas, she would lay out a huge, soft blanket for the baby to lay, scoot, play and roll all over. It kept him from being on the hard wood floors, and it created a layer between him and the carpet. (You never know what a baby will find in the carpet!) So I decided to make a quilt, but didn't have any idea where to start... I had loads of fabric sitting in my apartment, and thought that might be a good place to get some ideas. And then I came across a bundle of star fabric and it all came together! 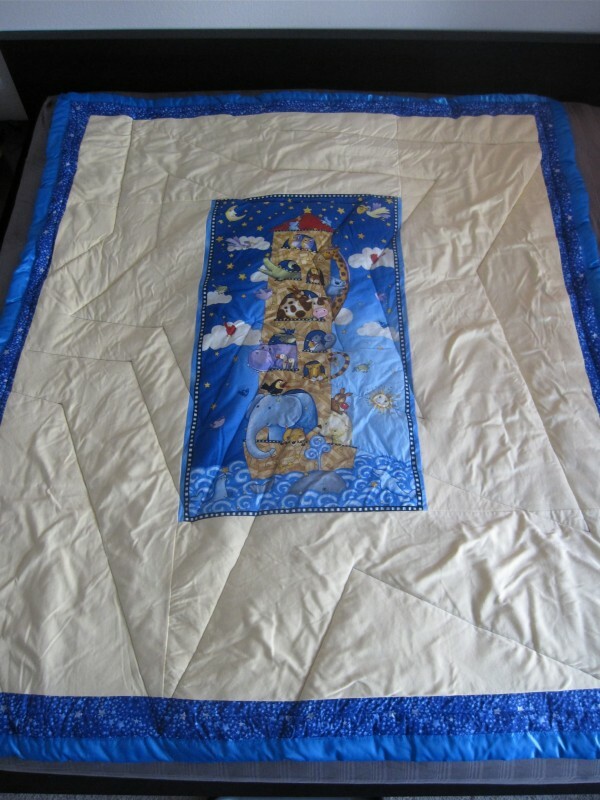 When my sister was in junior high, she started working on a quilt for her bedroom. 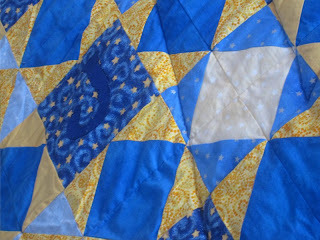 She had picked out blue and yellow fabrics for the project - some with stars, some just a very pretty color. However, the quilting didn't go very far before she discovered how annoying and precise the measurements and sewing has to be. HAHA She put the project aside, and during all of our moves over the last 10 years, I somehow inherited all of the left-over fabrics. So I decided to finish the project for her, and turn it into my baby gift. I did a ton of online research, and made sure to measure each piece twice before cutting. The pattern went together really well, and I only needed to get new fabric for my borders. Everything else was made from her original plan. I decided to add the alphabet to the front of the quilt, making it a little something special for my nephew, and I sure hope he appreciates it! Those letters were the bane of my existence for a couple of weeks there!! For the back, I used some super-soft jersey and found the perfect center panel to go along with their animal-themed nursery. 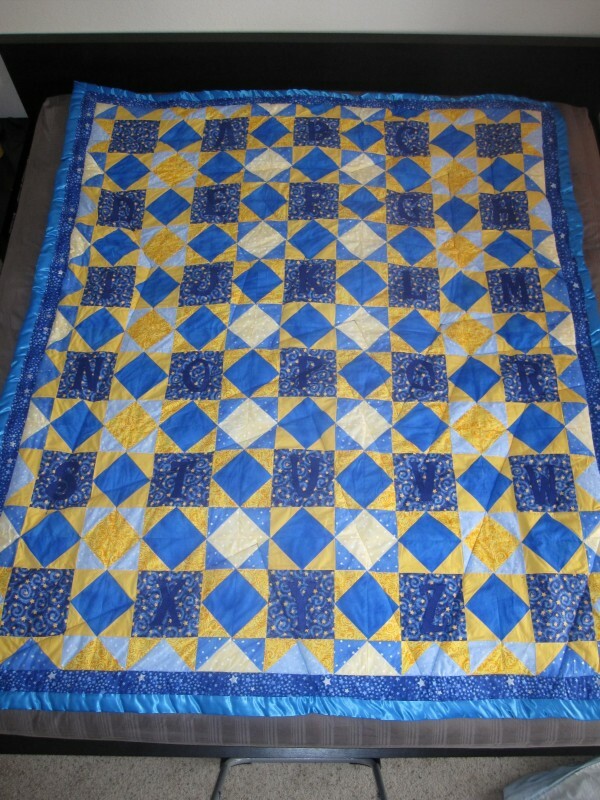 I have to say that I'm quite proud of the end result, and I hope that my sister and her son love the quilt for years to come.